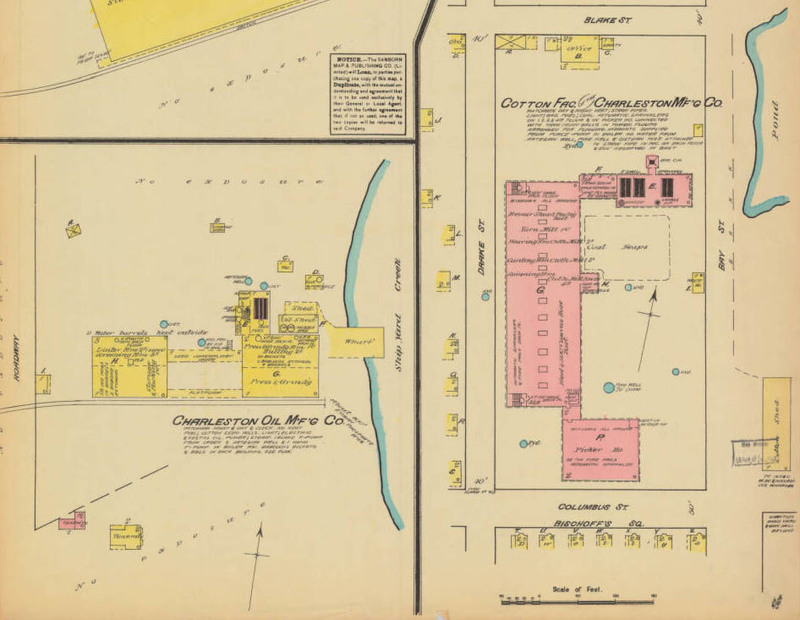 Map of the Cotton Factory, Sanborn Fire Insurance Map Company, Charleston, South Carolina, ca. 1888, courtesy of the South Caroliniana Library, University of South Carolina, Columbia, South Carolina. This map shows Amos B. Lockwood's design for Charleston's cotton mill. Lockwood was one of the most prominent mill engineers in the United States, specializing in factory construction. 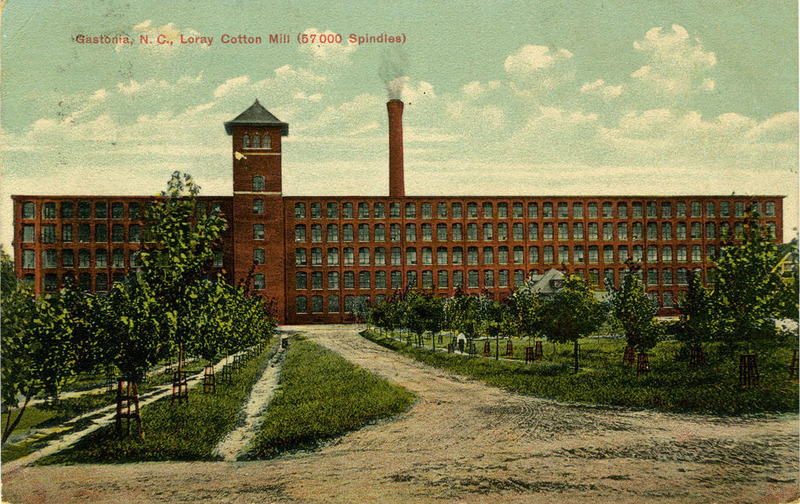 In 1881, a committee of investors set out to visit cotton mills in Massachusetts, Rhode Island, Maine, and Connecticut. The stockholders hired Amos B. Lockwood of Providence, Rhode Island, one of the most prominent mill engineers in the United States, to draw up plans for the building and to tell them what machinery to buy. Next, the company bought and cleared a large lot on the northeastern edge of the city between Blake and Columbus streets, fronting the Cooper River. The plans called for a four-story building with a machine shop; a warehouse; and a picker house, where ginned cotton would be cleaned of trash, along with engine rooms and a large chimney. One hundred feet wide by three hundred feet long, Lockwood’s design was organized around a central tower with an elevator and water closets inside. This was a standard factory design in the late nineteenth century, one that was being replicated in new factories across the nation, as well as in England. The company hired one hundred skilled bricklayers and mechanics. Other workers cleared the lot and stacked huge piles of red bricks imported from Augusta, Georgia. Engineers surveying the site discovered that the soft ground needed reinforcement to support such a large building. Investors decided to drive pilings into the marshy soil to create a much deeper “basement,” essentially creating a fifth story. Loray Cotton Mill, Gastonia, North Carolina, ca. 1905-1915, courtesy of the North Carolina Collection Photographic Archives, Wilson Library, University of North Carolina at Chapel Hill. Engineer Amos B. Lockwood designed the Charleston Cotton Mill and the Loray Cotton Mill, pictured above. This general design was typical for mills built throughout the United States and England during the late nineteenth century. In October 1881, a small group of men working on the mill construction who were associated with the local branch of the National Bricklayers Union went on strike, demanding a ten-hour day with an hour off for dinner. The mill owners refused to bargain. Further down the peninsula, 1500 cotton handlers on the wharves and in the cotton presses simultaneously demanded a twenty percent increase in wages. Two weeks later, the cotton workers were all back on the job, some of them having won small increases in wages, and so were the bricklayers. In June 1882, bricklayers walked off the cotton factory job again, upset that one workman had received fifty cents extra a day to oversee work on top of the building’s tall brick chimney, which towered 111 feet in the air. The city deployed policemen to the factory to guard against riots. The national brick workers union stood behind the strikers, but their protests failed to win any real concessions.